Inarizushi (稲荷寿司) is a pouch of aburaage (fried tofu) filled with sushi rice. This recipe is perfect for parties or any kind of event! 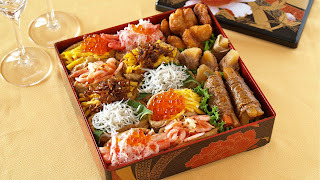 In this video, I will show you how to arrange Inarizushi for Hanami Bento (Bento box for Sakura / cherry blossom viewing). Compared to the store-bought Inariage (flavored Aburaage) they are not too sweet but very mild in flavor. Good for your health! Yummy!!! 1. Place the Aburaage on a cutting board and trace the Aburaage with a chopstick to make it easy to open. Then cut in halves and open. If you want to make a change, you can turn the skins inside out! 2. Put the Aburaage in boiling water for a minute to remove the excess oil. Drain in a strainer and soak them in a bowl of water to cool. Stack up 3-4 pieces at a time, then drain well (press with your hands) like you make a rice ball. 3. Put B and Aburaage in a medium pan, then bring to a boil. Turn the heat down to low and cover with an Otoshibuta or a wooden drop-lid (you can substitute it with with a sheet of aluminum foil and use any small lid or a plate as a weight if needed) and allow to simmer until the liquid is reduced to 1/4. Stop the heat and let them cool completely. 4. Make Sushi vinegar by mixing A (or use store-bought Sushi vinegar). Add the Sushi vinegar while the rice is hot and slice through the rice using a rice paddle to separate the grains. Mix sesame seeds in the Sushi rice if you like. Divide the rice into 14 equal portions. Wet your hands and make small balls of Sushi rice. 5, Take a piece of Aburaage and lightly press with your hand to remove the excess liquid. Open the pouch and fold back the cut edge to make it easy to stuff the rice. Stuff a ball of Sushi rice to the corners of Aburaage with your fingers, then close the pouch.